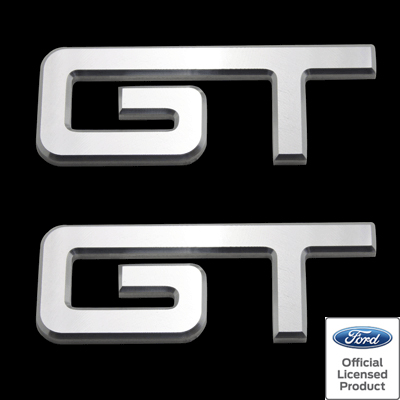 Replace the factory plastic emblem on your Ford Mustang with this Solid Billet aluminum 05-14 Style GT Emblem set. This custom machined Billet emblem features a perfect finish that will never fade in the sun or crack over time. » Measures 4 1/2" x 1 11/16" x 1/4"
Installs in 5 minutes or less with automotive silicone adhesive (not supplied). 1982 1983 1984 1985 1986 1987 1988 1989 1990 1991 1992 1993 1994 1995 1996 1997 1998 1999 2000 2001 2002 2003 2004 2005 2006 2007 2008 2009 2010 2011 2012 2013 2014 V8 GT Mustang Steeda Roush & Saleen Vehicles. UPR Products brings you the best aftermarket Billet dress up accessories, Street-Strip & Racing Suspension & Performance Parts for your late model American Muscle Car!